This has got to be one of the niftiest, most creative ideas for repurposing something old and worn-out into a useful garden structure. I used to walk by this in our old neighborhood, and made a trip back there yesterday to see if it was still there – and it was! 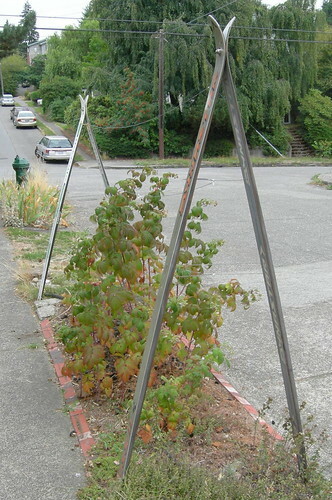 The gardeners, who have a wildly colorful Victorian-style house on a fairly busy Seattle street, complete with a chicken coop and a woodshed (very country-in-the-city), have turned their side parking strip into a raspberry patch with the help of two pair of old downhill skis, a few bolts, and some wire. The look is whimsical and has never failed to make me smile when I pass it. 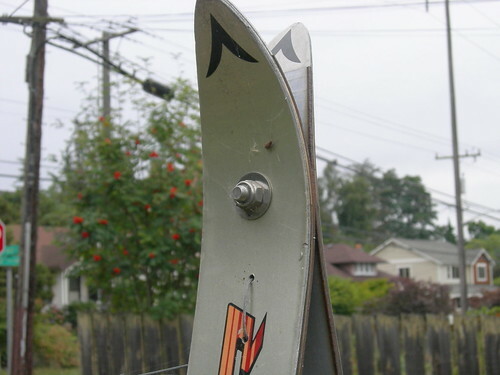 It’s also super sturdy, I think it’s been there for at least 6 years and probably longer than that. Neighbors seem to respect the berries and not pick, as there were many still clinging to the vines even though the leaves are now showing their fall colors and getting ready to let go. 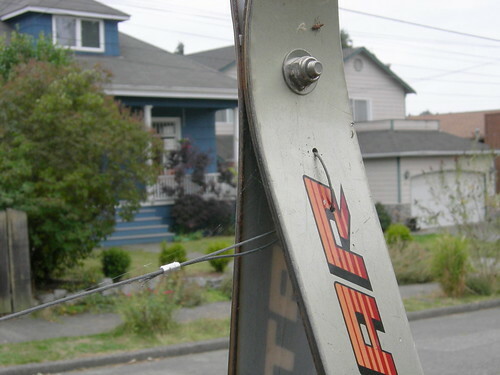 Do you have a favorite recycled/reused/repurposed thing you’ve used yourself or seen in someone else’s garden? 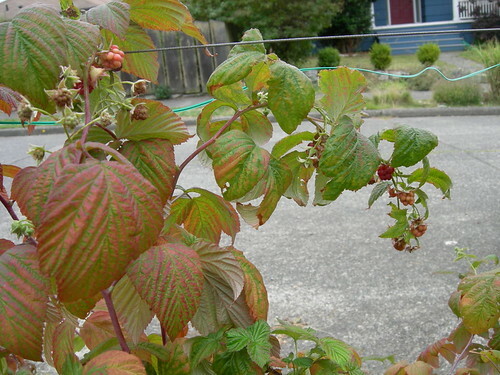 Here is proof that you CAN plant tasty berries in your parking strip, at least in my corner of Seattle, and you will probably have some left for yourself even after any greedy birds or humans have had a taste. Late-summer blueberries fresh from the bush are one of life’s purest joys. But how to ensure that you have enough to put in a pie or at least on your cereal? 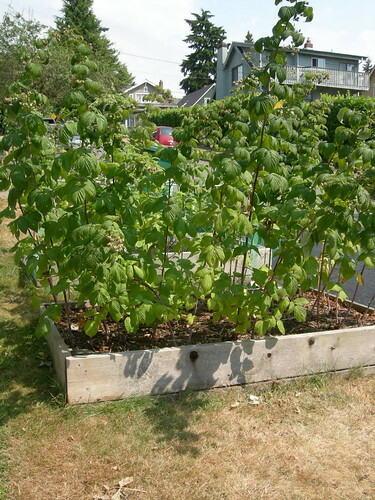 Here is one street gardener’s solution: raised bed + stakes + netting = happy harvesting. 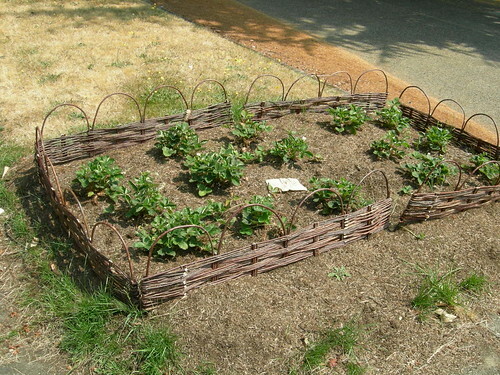 Finally, here is the bravest soul of all – a neighbor dug out a small patch of the parking strip grass and planted a strawberry bed. 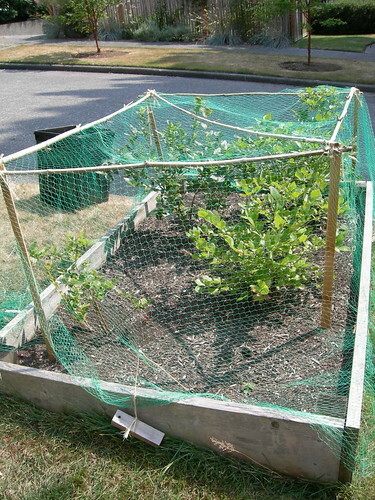 It’s ringed with a sweet basket-weave fence and gets a ton of sun. Do they get any berries? I hope so! Has anyone else tried raising such tempting treats on the street? How’s it going?